Project Description: Love working small? Grafix Shrink Film allows you to do exactly that! 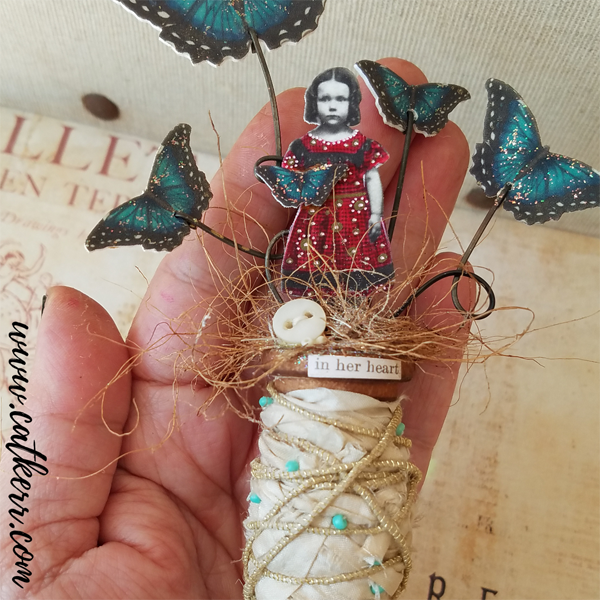 Create an itty bitty spool assemblage using Shrink Film, wonderful images, Aqua pens and so much more! Print the Shrink Film Images by Stephanie Rubiano onto Grafix Shrink Film and let it dry. Add color to your images if desired by using markers. Preheat oven to 300° degrees. Note: Make sure that you are using a designated craft toaster oven. Add Grafix Matte Dura-Lar Film underneath and above your pieces and then place in a tray in the oven. Watch them while they cook as they shrink quickly. Once they have shrunken and flatten out remove them from the oven with a spatula and place a tile over them to flatten them out completely. Cut three pieces of wire in assorted sizes ranging from 4” to 6”. Fold one corner to a 90-degree angle using pliers, feed the butterfly, fold the wire back down, trim the tail with wire cutters and press the tail firmly securing the butterfly in place. Add some loops to the wire to represent movement. Add Glitter Glue to the center of the butterfly and spread it with your fingers. Next add some glue to a tiny butterfly and glue it on to the girl. 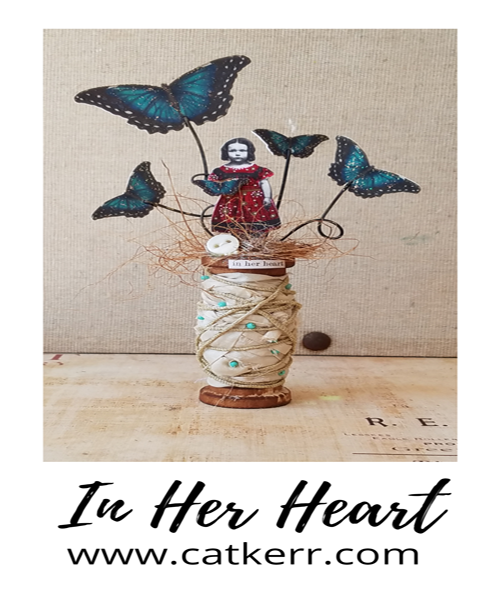 Add some Vintage Photo Distress Ink to a store bought spool. Wrap sari ribbon and string around the spool and finish the spool by sewing on tiny seed beads. Tie all the wire butterflies together with some string. Add glue to the opening of the spool and then place your butterflies into the hole. Adjust them if necessary and let dry. Add glue to the girl and place her in front of the wire butterflies and let dry. Add a sticker title to the spool. Add glue to the top of the spool and add some coconut fibers as well as glitter and a button.